The amount of available open datasets is increasing. However, most of these datasets are not usable. In order to improve the usability of these datasets, mandatory open data principles have to be drawn up. Tom Kunzler, ad interim director of the Open State Foundation, pleads to implement mandatory open data standards in his new iBestuur column. Mandatory open data standards would not only increase the usability of the data, but also assure that the effort governmental institutions, such as municipalities, put into publishing open data would not go wasted. Some standards have been published already. Open State Foundation made use of one of these standards for its project waarismijnstemlokaal.nl. Nevertheless, more work needs to be done to ensure that more standards are implemented. 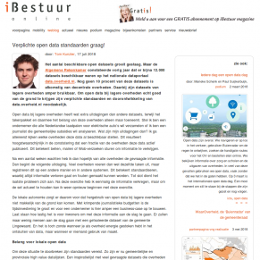 This also means that the governmental data portal of the Netherlands: data.overheid.nl needs to be further developed. Click here if you would like to read the Dutch article on this topic.